Enable keep alive on the website since http connection gets closed very soon once request is done.This means that the default HTTP connection is usually closed after each request has been completed, i.e the server closes the TCP connection after delivering the response. In order to keep the connection open for multiple requests, the keep-alive connection header can be used. By default HostingRaja VPS or cloud based server is not enabled with keep alive headers because If the client does not close the connection when all of the data it needs has been received, the resources needed to keep the connection open on the server will be unavailable for other clients and it will impact on server load due to more RAM consumption. How can we can enable keep alive? Keeping the server alive has the highest impact on the reliability of the server. For the VPS and above categorized website hosting services in india the root access is given by which you can change the configuration in order to achieve this. KeepAlive: Whether or not to allow persistent connections (more than one request per connection). Set to "Off" to deactivate. MaxKeepAliveRequests: The maximum number of requests to allow during a persistent connection. Set to 0 to allow an unlimited amount. Improves website speed means it reduces latency associated with HTTP transfers and delivers a better user experience. Enabling Keep Alive increases memory usage on the server. In server Apache processes have to keep connections open waiting for new requests from established connections. While they are waiting they are occupying RAM that could be used to service other clients. 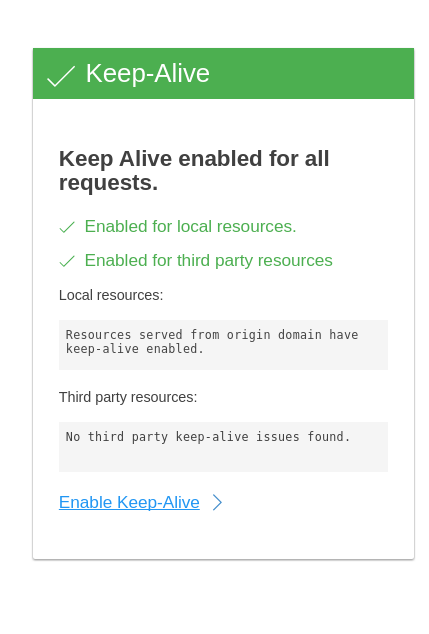 If you turn off KeepAlive apache processes will remain active. This will lower memory usage and allow Apache to serve more users. RAM is very biggest limiting factor in web server, If you are having very less RAM then its better to turnoff keep alive on your server because having Apache processes hanging around while they wait for more requests from persistent connections is a waste of precious memory. If you have pages with a lot of images or other files linked into them, KeepAlive will improve the user experience significantly. This is because a single connection will be used to transfer multiple files. It is very important to make sure that type of traffic you are getting on daily basis.If you are getting more hits to your website in a short period of time then its better to disable the Keep alive because your RAM usage will get exceeded if it is in enable mode. Note; When you buy any server solution from HostingRaja you get free domain name registration India. And you can choose your desired domain extensions that is .com or .in.